So here’s the situation … most people remember the old Phil & Derek’s restaurant (you know, the delicious assortment of brunch foods and those three flavors of bottomless mimosas). Well, when they opened up in a new location, everyone wondered if it would live up to the hype – well, we are here to say yes, it does – and then some! 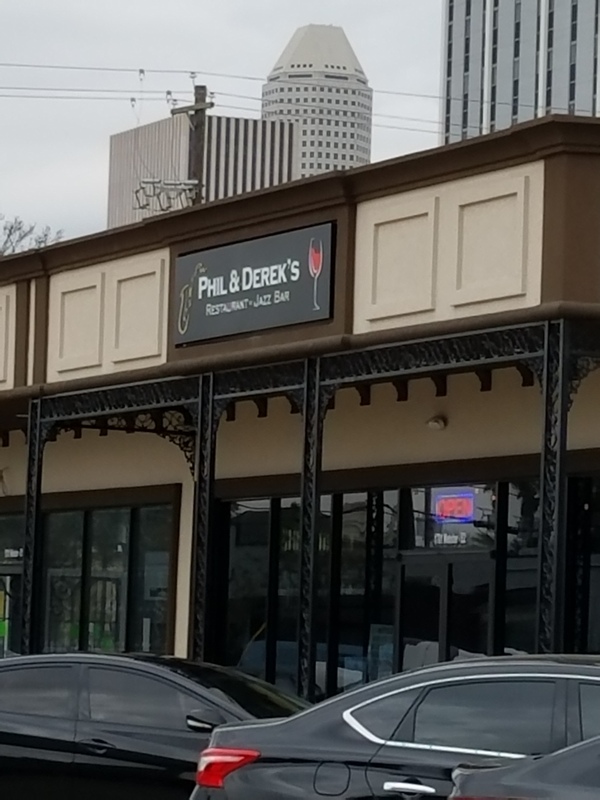 2 Girls Who Travel stopped by the all-new Phil & Derek’s in Midtown (1701 Webster St.) and were instantly excited to see the new look. The bar area and outside patio are perfect for gatherings and parties. We opted for the patio where a DJ was playing a great assortment of new and old favorites. 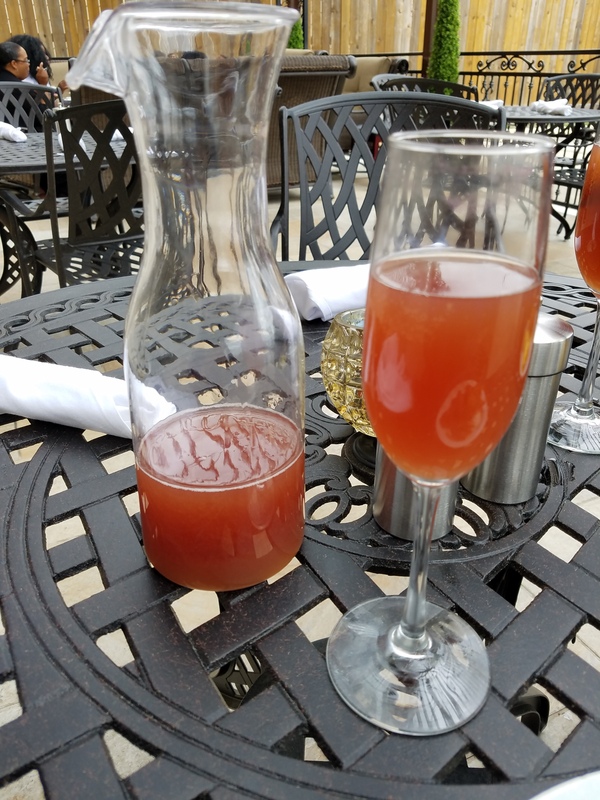 This patio experience was awesome – and one of the standouts of the new location! Okay yall, so this is where it gets really good … complimentary mimosas! All the mimosa you want, at no extra cost. We decided on the pomegranate, but they also have orange and raspberry. Can you ever go wrong with bottomless mimosas? It’s one of the best parts of brunch! The server even brought us a carafe (swoon). Now to the food. If you ever had the pleasure of dining at the old location, you probably remember the food – catfish, omelets, fried chicken, greens, etc. Expect more of the same here! The brunch buffet is $27 – moderately priced compared to other brunch buffets in Houston! 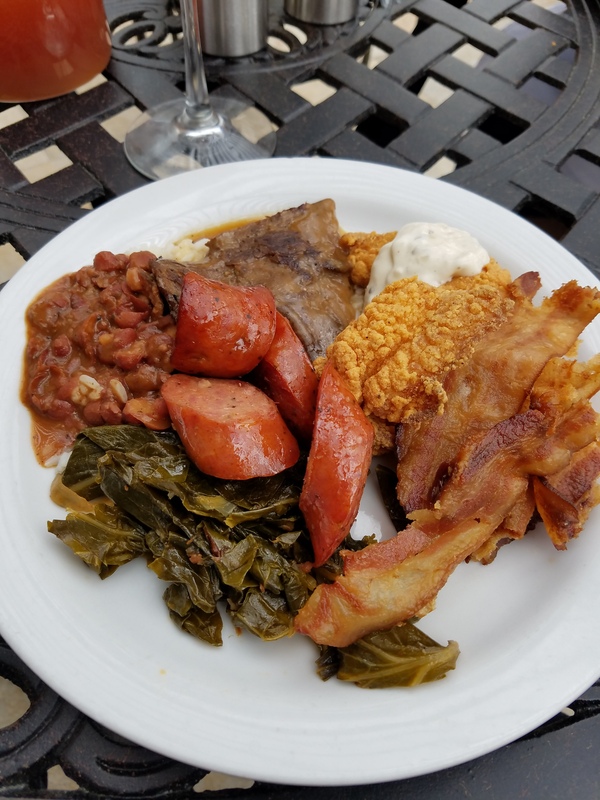 The exhaustive menu included an omelet station, bacon, waffles, sausage, cheese grits, catfish, fried chicken, green salad, pasta salad, potato salad, fruit, smothered steak, gumbo, red beans and rice and desserts. The food is excellent and the buffet was steadily refilled and maintained by the staff while we were there. All good signs for a great buffet experience. No waiting on your favorite food to come! Our server was attentive – offered refills of our carafe and removed our plates as we went back for seconds (of course we went back for seconds). Parking was to be expected for Midtown – there’s a small lot, so expect it to get full rather quickly during peak times. But street parking is also available. So, we have a cool, laid-back atmosphere, great service and delicious food. Phil & Derek’s is back, stronger than ever. No doubt this will be the go-to spot for brunch – dare we say one of the best brunches in Houston … quite possibly! For more information on Phil & Derek’s, visit www.philanddereks.com. Next post2 Girls Who Travel Deal of the Month: Dine at Applebee’s for Half Off!